Shouer 首尔 gaining acceptance in China? Ohmynews tells, quoting the Korean Foreign Ministry, that Chinese-character name 首尔/首爾 (Ch. 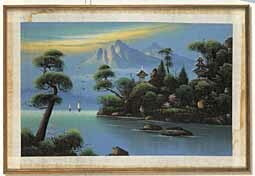 Shouer) that the city of Seoul last month promulgated to be used instead of 汉城/漢城 (Ch. Hancheng) has been gaining some ground in the mainland Chinese media. In some of the recent reports in Renmin Ribao (People's Daily) and an associated newspaper for youth (中國靑年報), Seoul has been given as 首尔, with 汉城 in brackets next to the new term. On the other hand, the Xinhua news agency has been continuing the use of 汉城. Would it be that the position of South Korea as a kind of a modernization model for China is not hurting the chances of "Shouer" to gain acceptance. Here's one googled example of a report on Korean art scene in Seoul, in which 首尔 is used. "Anthropologist's Journey to the Past: Searching for the History of a Red Village" (인류학자의 과거여행: 한 빨갱이 마을의 역사를 찾아서) by Yoon Taek-lim (윤택림) is a book that I've been browsing through a bit after acquiring it quite a long time ago. It's not that directly relevant for my own research topic, but I should have been able to invest more time for it. The "history of a red village" is mainly about what happened before, during, and after the Korean War in a village in Southern Chungcheong province. The village is situated in Yesan County, and the place was back at that time so known for the leftist activity as to be called "Moscow of Yesan". For all the death and killing on both sides during the conflict, and for the political situation in the peninsula after the cessation of the war, it is no wonder that there are very little traces left of all the "reddishness" of the village. The villagers, whether surviving reds, their descendants or others, saw what the anthropologist wanted to find out about merely as "the past," which at one time had been denied of them and what in the modern (late 80s and 90s) Korea was of no use for the identity and the quality of life of the villagers. What was now important and valid in their lives was the quality of live (chal salda); compared to the past life had improved a great deal, but compared to the wealthy middle class in cities their lives as consumers were poor. And they wanted to be the kind of consumers that the urban middle class was. The commentator "jook_when_ill" took issue with my above reference to anthropologists and Park Chung-hee nostalgy. On the second thought, he or she is correct that the take on anthros is not appropriate; I'm wrong to give an impression that Yoon Taek-lim wouldn't approve the villagers' views of Korea's development, on the contrary. From my thus far quite cursory reading it seems that she'd expected to see some of the old leftism reappear after the change of the political climate, but she no way expresses any dismay in the villagers' enthusiastic participation in the modern consumerism. 스스로 서민이고 민중이면서도 박정희를 높이 평가하는 역설이 생겨나고 있습니다. 심지어 박정희의 딸 만이라는 이유로 국회의원이 되고 제1야당 부총재가 되고 대통령선거 후보로 거론되기까지 합니다. 저는 총통 박정희의 음성이 지금도 들리는 듯 합니다. '박정희의 자식 ' 들인 이 나라의 수구언론들이 발행하는 지면에서 그의 망령은 지금도 어슬렁거리고 있습니다. I'm not sure if you imply that with that particular comment I tried to appeal to "the average left-hating korean expat blogreader", but if you've visited this place before you should have no reason to believe so. This was not supposed to be a not about Park Chung-hee, but that's how it became, and I'm not the least to blame. So for now, I'll only add one quote from my own research notes. The following is what I wrote down after listening to a conversation between a rice mill keeper (himself a GNP voter) and two neighborhood women (one former grocery store keeper, the other kept a butcher's store with her husband), all close acquaintances. Ohmynews tells that Small and Medium Business Administration (중소기업청) has decided to issue a national gift certificate for marketplaces (chaerae sijang) as one measure to support the struggling marketplace business. 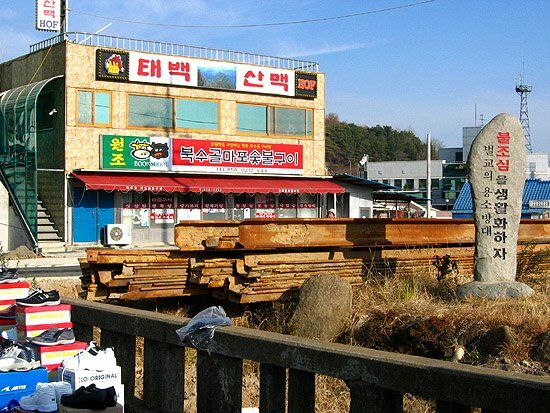 A marketplace gift certificate was first issued in the Jukdo Market in Pohang, and it proved successful (another Ohmynews piece). For some strange reason, "inequality" is one of the words of the English language that always escapes my mind when I need to write it (or use otherwise). Also now I had to look it from pulpyôngdûng in the dictionary. But this is not the main point of this note, not even a starter. Inequality is a continuous issue in South Korea, no matter what the developments of democracy and distribution of wealth are. Phrases like pinikpin puikpu (貧益貧富益富, poor getting poorer and rich getting richer) or yujôn mujoe mujôn yujoe (有錢無罪無錢有罪, innocent if rich, guilty if poor) are constantly given new life, not the least since the late 90s' economic crisis and the changed social and economic landscape since. Korea Institute for Health and Social Affairs has recently surveyed about the Koreans' perceptions of equality and inequality in the society, and not surprisingly, the general view is that the inequality is severe and only increasing (reported in Pressian). I'll finish this note later, and for now I just link a table from the Pressian article about the perceptions of inequality of wealth, divided to three income strata: low-income, middle class, and high-income. Barbershop insults, and more about the "hair clipping controversy"
The people at EBS, (Education Broadcasting System?) are not happy that a comedian at SBS made the word ibalso (barbershop) out of the three letters ebs in a section of a comedy program in which Roman character terms are given a comic interpretetion. In the Korean order of things, getting likened to a barbershop is disparaging. Chosun Ilbo tells further that EBS has interpreted this insult in the context of its competition with SBS and the coming screening of digital broadcasting licences. For the illustration of this note I've googled a kind of a painting which in Korea is called ibalso kûrim, "barbershop picture", not necessary for being mostly on display in barbershops but being of low status in terms of art and on display for popular viewing in "non-art" places. Don't know what the English term for this kind of art is, but here we call that "marketplace art", for being sold in marketplaces outside of the "normal" art market. This piece of news reminded of the issue from late last year, when the Korean Barbershop Association had managed to persuade the Korean Ministry of Health and Welfare to issue a ruling, in which the (hygiene?) law was interpreted to prohibit the use of a clipping machine (ibalgi/parik'ang) in hairdressing shops in favor of barbershops (my entry from last December). Let's see what the later developments in the "parik'ang controversy" are. KBS News ran a story on the parik'ang controversy on January 28. Barbers' Association is continuing its struggle for the survival of barbershops, but the odds are not good, as the the Health Ministry seems to have thought out that they have better things to do than control (tansok) the use of hair clipping machines. The proprietor of "The Dispossessed" has visited Beolgyo, home place of the novelist Jo and the main site of the first volumes of the novel, and taken nice photographs of sites mentioned in Taebaek Sanmaek: bridges, reed fields and so on. The sole thing reminding of the fact that the place is the site of one of the most important Korean novels is a beer house (hof/hop'û), which has borrowed the name of the novel (see the photograph linked from The Dispossessed). On another note, lookin the photos in The Dispossessed I just can't help envying all the sunshine of the Korean winter. Please see Robert Koehler's photos and a report of a visit to Beolgyo in September-October 2006. Oranckay got there first, apparently as a consequence of a posting in The List, to tell that an English translation of a novel from 1931 by Yom Sang-seop, "Three Generations" (三代/Samdae) will be published in English and that it's required reading for all interested in modern Korea. 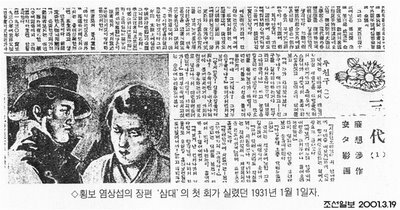 Three Generations, first published as a serial in Chosun Ilbo is about - three generations in the colonial Korea. An educational site Koreannote has a good introduction of the book and the storyline in Korean, made to prepare Korean highschoolers for the graduation exam. The three generations are the grandfather Cho Ûi-gwan, a traditionally-minded landowner who buys himself a lineage genealogy (chokpo) to go for a yangban; the father Cho Sang-hun, who has accepted the new things as his own but still lives by wasting the family fortune; son Cho Tôk-ki, who has a good character but is caught in the discord between the father and grandfather and lives an irresolute (uyubudanhada) life. Three Generations charts the tensions in the Jo family in 1930s Japanese-occupied Seoul. Yom’s keenly observant eye reveals family tensions with profound insight. His characters are so alive that if you cut the pages they might bleed. Delving deeply into each character’s history and beliefs, he illuminates the diverse pressures and impulses driving each one. This Korean classic also brings forth the larger issues at hand, revealing Korea’s situation under Japanese rule, the traditional Korean familial structure, political movements of the 1930s (both national and international), and the battle between the modern and the traditional. Touted as one of Korea’s most important works of fiction, Three Generations gave birth to naturalism in Korean literature. Best representing the Seoul dialect of the time, Yom is celebrated even today for his contributions to Korean literature; Three Generations remains a mandatory read for high school students. The long-awaited publication of this masterpiece is a vital addition to canonical Korean literature in English. 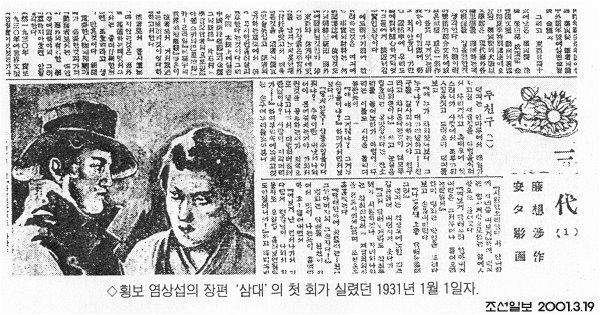 The first part of "Three Generations" published in Chosun Ilbo in January 1, 1931 (linked from an education site Koreannote) Seems that the illustrations were done An Sôk-chu, here appearing as An Sôk (安夕), whose illustrated writings (manmun manhwa) from the 1930s were the subject of Sin Myông-jik's Modôn ppoi Kyôngsôngûl kônilda, a study of the images of modernity in the colonial Korea (see the sidebar for the book cover). "얘, 누가 찾아왔나 보다. 그 누구냐? 대가리꼴 하고 . 친구를 잘 사귀어야 하는 거야. 친구라고 찾아온다는 것이 왜 모두 그 따위뿐이냐? " "얘, 얘, 그게 뭐냐? 그게 무슨 이불이냐?" "당치 않은! 삼동주 이불이 다 뭐냐? 주속이란 내 낫세나 되어야 몸에 걸치는 거야. 가외 저런 것을, 공부하는 애가 외국으로 끌로 나가서 더럽혀 버릴 테란 말이냐? 사람이 지각머리가 ." 하며, 부엌 속에 쪽치고 섰는 손주며느리를 쏘아본다. 덕기는 조부의 꾸지람이 다른 데로 옮아간 틈을 타서 사랑으로 빠져 나왔다. 머리가 덥수룩하고 꼴이 말이 아니라는 조부의 말눈치로 보아서 김병화가 온 것이 짐작되었다. "야아, 그러지 않아도 저녁 먹고 내가 가려 하였었네." 덕기는 이틀 만에 만나는 이 친구를, 더욱이 내일이면 작별하고 말 터이니만치 반갑게 맞았다. "자네 같은 부르주아가 내게까지! 자네가 작별하려 다닐 데는 적어도 조선 은행 총재나 ." 병화는 부옇게 먼지가 앉은 외투 주머니에 두 손을 찌른 채 딱 버티고 서서 이렇게 비꼬는 수작을 하고서는 껄껄 웃어 버린다. "만나는 족족 그렇게도 짓궂게 한 마디씩 비꼬아 보아야만 직성이 풀리겠나? 그 성미를 좀 버리게." 덕기는 병화의 부르주아, 부르주아 하는 소리가 듣기 싫었다. 먹을 게 있는 것은 다행하다고 속으로 생각지 않은 게 아니나, 시대가 시대이니만치 그런 소리가 ---더구나 비꼬는 소리는 듣고 싶지 않았다. "들어가선 무얼 하나. 출출한데 나가세그려. 수 좋아야 하루에 한 끼 걸리는 눈칫밥 먹으러 하숙에 기어들어가고도 싶지 않은데 . 군자금만 대게. 내 좋은 데 안내를 해 줄게!" "시원한 소리 한다. 내 안내할게 자네 좀 내 보게." 하며, 덕기는 임시 제 방으로 쓰는 아랫방으로 들어갔다. "여보게, 담배부터 하나 내게. 내 턱은 그저 무어나 들어오라는 턱일세." 하며, 병화는 방 안을 들여다보고 손을 내밀었다. "나 없을 땐 온통 담배를 굶데그려." "그저 담배 한 개라도 착취를 해야 시원하겠나? 자네와 나와는 착취, 피착취의 계급적 의식을 전도시키세." Defining terminology: "progress" and "ordinary people"
It's not today's news that the Korean term 'progress' (chinbo / jinbo) is being diluted into meaning nothing or being synonymous with sympathy for authoritarianism and dictatorship. The same happened in Finland in the 1970s when 'progress' (Fi. edistys) was in certain circles measured in one's attitude towards Soviet Union; for example trying to have textbooks critical (?) of the Soviet Union removed from university courses was progress. This time Voice of People, a newssite which has been a frontrunner in these developments of the progress of the term 'progress', has an article in which, in the wake of the recent DPRK announcement of the possession of a nuclear weapon, a representative of a "unification organization" explains what progress means. It is obvious that such organizations are not pleased that some other groups which elsewhere claim to be progressive have put part of the responsibility of the nuclear development on the country that did the development. In their view, that cannot be progress, since progress is taking the side of DPRK in all issues. First, representative Hwang Seon [of Unification Alliance] says of the statement by People's Solidarity for Participatory Democracy that there are many with a "DPRK complex" among intellectuals who claim to be progressives. They are suspective of Chosun, Joongang, and Donga [newspapers], but in the case of the North, they trust the main newspapers as such and accept the stories coming from them as truth. The representative Hwang Seon explains, that in the South the basis for progress is the view on North Korea (Ibuk). "The people who don't have a solified (hwakkohada) view on the North, are putting blame on both sides." He points out that if North Korea is not viewed with an open mind, it's difficult to achieve solid progressiveness. And now for a concept which is closer to my heart, and of which I've made numerous notes before. Hankyoreh writes that while banks are sitting on heaps of money after a very good year of 2004, the financial services available for the "ordinary people" (seomin / sômin) are getting thinner and thinner. (This time "ordinary people's financial services" [sômin kûmyung] doesn't refer to separate financing institutions but to services available in banks.) Very fittingly with the concept sômin, the two cases given in the article are woman selling eggs and vegetables in a marketplace and a keeper of a beer house. One of the often recurring characteristics of "ordinary people" is the disadvantage in getting financial services, which often makes them to turn to curb loans and usury. Tuned my cellphone radio in the commuter train on my way home to Radio Helsinki last Monday; what the hell, this etheric pop tune is sung in Korean! It was such a startling experience (hearing a Korean song in Finnish radio, and a good one at that) that I had to mail the program host and ask what it was. It was a tune from the soundtrack of 4inyong sikt'ak ("table for four", in its original English name The Uninvited), a horror movie from 2003 which has escaped my attention. 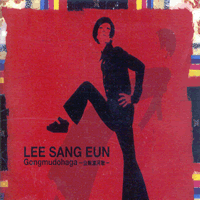 The song Chandie pein namu ("Tree felled on grass", or in the original Anglo-Korean, "Grass-cut tree") was sung by Jung Ma-ri, tune by Jang Young-gyu and lyrics by Paek Jin (two last from Uhuhboo Band /어어부 밴드). The piece of the "road-managing" of their school-age children by Korean mothers in Korea Herald, already couple of weeks old, is interesting not that it'd reveal an unknown phenomenon but as a news that someone is making a detailed study of the topic. It is also a good remainder to think about the situation of the mothers in small businesses that I've talked to along the way in relation to their peers with better family resources. In a study of the changing role of motherhood in South Korea, Park So-jin, a Ph.D. candidate under the guidance of Nancy Abelmann in the Department of Anthropology, examined a sample of 40 middle- and working-class mothers in Seoul. Her results portray a competitive motherhood so driven that it is easy to understand why the United Nations Committee on the Rights of the Child announced in 2003 that the zealous educational atmosphere in South Korea violates children’s rights to play. The road-manager mother is a fairly recent phenomenon in South Korea. "Mothers are having to deal with a different atmosphere than when they grew up," Park said. During the military rule of General Chun Doo-hwan in the 1980s, private after-school programs were banned with the goal of developing a national equalized educational program, committed to developing world citizens. "Still, some wealthy South Koreans were widely suspected of secretly hiring private tutors," Park said. Following the democratic movement in 1987 and the educational reforms in the 1990s, drastic changes were made to deregulate the educational system and remove the bans on private tutoring programs. "These changes were solidified in 2000, when the bans were ruled as unconstitutional," Park explained. Since then, the private after-school market has grown exponentially. Due to the time investment required to be a successful manager mother, many women find that they are pulled between motherhood and the need to work part time to pay for the programs. South Korean families spend, "about $2,000 a year on after-school programs on the low end," Park said. But she contends that the expense is underestimated in surveys because many families are unwilling to admit how much of their income goes toward extra classes. "Because of the diversification of the educational market and recent reforms, the manager mother has emerged as an indispensable figure," Park said. It's not just one or two shopkeeping women who'd expressed their will to stay at home, or told of their plan to stay at home when opening a new business elsewhere, but more often than not it just doesn't go that way. 우리 공화국의 자존심을 건드리는 자 어디에 있든 결판 낼 것이다! 조선인민민주주의공화국에서 나라이름을 본국의 명칭에 따라 이르는 것을 원칙으로 하고 있습니다. 남조선에서 "스웨덴"이라 하는 나라를 조선에서 "스웨리예"라 이르는데, 우리 공화국을 "수오미"라 하지 않고 "핀란드"라고 하는 것은 이 조선인민민주주의공화국의 국가명칭의 원칙을 어기는 것뿐만 아니라 우리 공화국에 대한 모독이며 위험한 돌발행위이다. 미제 치하헤서 자주 정책을 발휘하지 못 하는 남조선에서 미제의 지시에 따라 "핀란드"라고 할 수밖에 없는 것을 이해할 수는 있겠지만 인류 역사상에서 가장 자주적이고 인간중심적인 나라인 조선인민민주중의공화국은 이러한 관행을 실시하는 한 수오미 인민들의 분노가 가라앉지 않을 것이고 수오미는 우리 공화국의 자존심을 건드리는 자들을 확고히 박살해 버리는 선민(善民) 정책을 결국 포기할 수 없는 것을 밝혀 두며 조선인민민주주의공화국은 우리 공화국의 명칭문제를 바른 시일내에 바로잡지 않으면 수-조 관계가 위험한 국면을 면할 수 없을 것이다. It's delightful to have been included in the blogroll of such a fine blog as Delicious Biting, "musings of a L.A. flaneuse on all things delicious, irreverent, and incongruous". To send my regards to the proprietor of the Biting, I include a photo of our dinner last summer, which was one of the few occasions in the generally miserable weather conditions we were able to eat in our balcony. 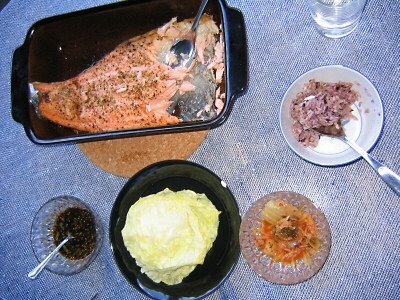 Korean flavor with ingredients of which quite few need to be shopped in an Asian food store: salmon baked in an oven, one head of steamed cabbage as wrapper (ssam), kimchi, 5-grain rice (rice, sweet rice, barley, black rice, millet), soy sauce with seasonings. Back in '99 I had happened to hear a song from television (must have been some satellite channel of KBS) which sounded totally different from most of what was spilled out from the box. (There have always been music programs done with dignity though, like Yi So-ra's one.) The tune I heard was by Lee Sang-eun, whose music I've been following to some degree ever since, also getting hold on most of her albums, of which the older ones have been difficult to get by. She is giving two concerts in Chongdong Theater (정동극장) in Jeong-dong (정동), downtown Seoul behind Deoksu palace on 11th and 12th of this month (the same place where the singer Kim Yong-woo performed just recently). Lee Sang-eun is a special case in that in the beginning of her career she was part of the entertainment industry, singing what the producers gave her to sing, but she broke out of that mold after two albums, and has done her own music ever since, mostly in cooperation with the Japanese multi-instrumentalist Takeda Hajimu. Her album Gongmudohaga from 1995 is to me a classic of Korean avantgarde(?) or artistic pop, with strong tunes throughout the album and well-thought arrangements by Takeda. Of her music, that's what I play most often. She has usually both English and Korean lyrics; the former tend to be sometimes a bit awkward, but I don't let that disturb the listening. Her latest album Sinbicheheom (신비체험) in Seoul Selection; I remember reading from some review of that album (which I haven't heard myself) that her craving to be an artist may leave an awkward feeling for a listener; perhaps I'll have to agree with that. But at least that's not the case with Gongmudohaga, which unfortunately seems to be out of print at the moment. May the year of the chicken be full of warmth and happiness, and may all your enterprises be successful. Busan Ilbo tells of a survey by the Bank of Korea, that the wage level of irregular workers in 2003 was 49.7% of that of regularly (permanently) employed workers, which is a remarkably lower figure than in Western nations. The figure had fallen below 50% from the 53.4% in 2002. The gap between permanently and irregularly employed workers is expected to widen further in 2004. The same figure in Germany is 83%, Denmark 78%, Finland 77%, Italy 72%, France 71%. The figures show what kind of an impact the "IMF crisis" had on labor. The proportion of regular labor seems to have increased slightly in the last years, but it cannot be much of a solace when the income gap is constantly widening. And this really is a huge problem for the unions and for the representation of the interest of workers in general. Is the interest of a Hyundai Automobile plant worker the same as the interest of a worker of a Hyundai Automobile subcontracting company? Or better, does the former see his own interests coincide with the latter? When the option is sending one's child to good schools as far as possible from the factory, I'm afraid that's hardly the case. 서민의 입장에서 볼 때, 자동차는 사치품이 돼버린 것인가. 최근 시행되고 있는 정부 시책을 곰곰이 들여다보면, 돈 없는 사람들은 오로지 버스와 지하철만 이용하라고 무언의 압력(? )을 가하고 있는 것처럼 보인다. 자동차에 부과된 특별소비세 인하를 6개월 연장하는 반면, 주로 승합차나 화물차의 연료로 사용되는 경유값은 2007년까지 휘발유의 85%선까지 인상되기 때문이다. The article takes up to things to represent the current atmosphere among the "ordinary people": fortunetelling and gambling. Fortunetelling not because people would believe every word but to do even something, to grasp the final straw. The Rodeo Street in Apgujeong-dong is said to have become a "fortunetelling valley". "The telling of the fortune is not the most important thing. It's more like counseling (sangdam). People are hungry for words." 한때 유흥과 향락의 중심지로 손꼽혔던 서울 압구정동의 로데오 거리 역시 우후죽순으로 늘어난 점집들 덕분에 아예 ‘점술밸리’로 지정될 지경이다. 이곳에서 점집을 운영하고 있는 역술가 한만술씨(가명)는 불확실한 시대 사람들이 점집을 찾는 이유에 대해 이렇게 설명했다. 하필이면 판자촌? 그가 특별히 판자촌을 그리는 이유는 자신이 직접 판자촌에서 살아봤기 때문이라고 김 화백은 말했다. 그때의 소중한 기억들이 김 화백에게는 여전히 아릿하게 남아있다. 이런 기억도 있다. 그가 어느 날 혼자 판잣집 방에 있는데, 만삭이 된 양공주가 와서는 아이를 낳을 수 있도록 방을 잠깐 빌리자고 하더란다. 주인이 그가 있어서 안 된다고 하자 그는 아무 말 없이 방을 비워주고 밖으로 나왔었다고 했다. For the historically invaluable photographs by the Japanese photographer Kuwabara Shisei of Cheonggyecheon and its people in the 1960s before the covering of the river, see the gallery in the photography portal Zoom In (click the icon in the page to go to the gallery). The lunar new year is approaching, and in many Korean families tensions must be rising about how to spend the holiday, whom to visit, how to spend the ancestor rituals or whether to spend them at all. Ohmynews has an illuminating story of the mother-in-law thinks that the daughter-in-law has been behind the son's request not to observe the ch'arye (茶禮) this time, while it's been purely the son who's not interested in the idea of spending the rituals at all. 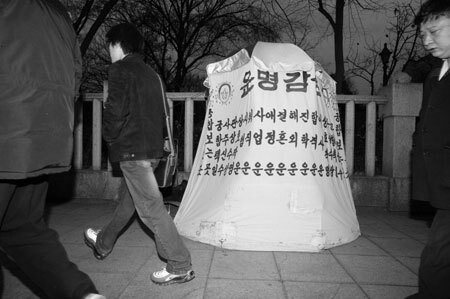 “에미야, 친정에선 차례를 안 지내냐?” Don't you observe the rituals in your own home? “애비가 하도 제사 지내지 말자고 그래서.” Because your husband insists on not doing the ritual. But the wife takes the side of her parents-in-law, thinking that she needs to do that in order for the family relations to stay good; she also appeals to the husband becoming the household head (hoju) [but not in legal terms as the law on the household head system (hojuje) is about to change] later and being able to excercise his own will better. So he agrees. Now what is the opinion of the husband to this? Agreeing to observe the ritual to avoid any bigger trouble, and for her wife not be suspected as the one who's obstructing the rituals. And interesting point when the general perception is that it's the daughters-in-law who are reluctant to participate in the rituals for all the work and toil it entails. This toil of women (especially daughters-in-law) and leisure of men in rituals is depicted in the following piece of modern folklore, which has been making rounds in the net for some years. 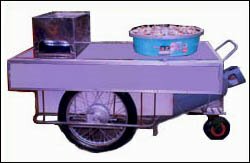 When checking the exact location of the Jungang Market near Sindang station of the Line 2 introduced in an Ohmynews feature, I ended up on the site of the handcart manufacturer Sinjungang Riôk'a, which has many kinds of carts and sweet potato baking drums in its selection. Since when has sonsure become riôk'a? 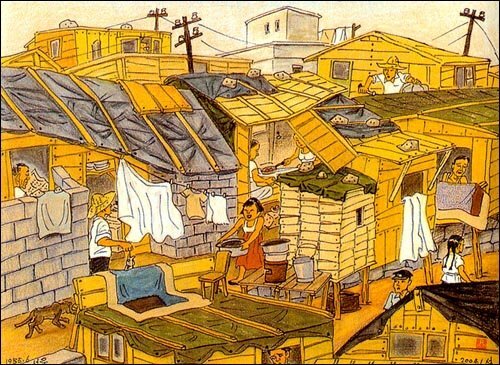 When South Korea modernized? 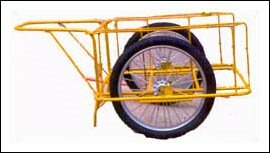 Wondering what's behind the Korean word, I checked the Standard Dictionary of Korean: it comes from rear car, which is I guess from having the cart attached to the rear of a bicycle. 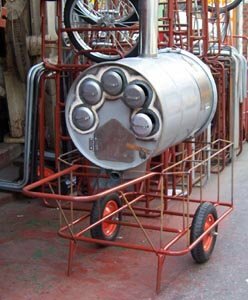 So riôk'a, "rear car" has come to designate also a handcart, sonsure. Korea Society Opinion Institute (sic) has surveyed that Our Open Party (OOP) has lost most of the support it enjoyed among the self-employed and housewifes last year (article in Chosun Ilbo). More than 40% of the self-employed supported OOP and 24% supported Grand National Party (GNP) in May 2004, but now the figure of OOP is only 21% whereas that of GNP 26%. What surprises me is the high figure of OOP support in 2004; my experience (which is of a very small number of people) and perception is that it'd never been high in the first place, but the support of parties as well as parties come and goes. 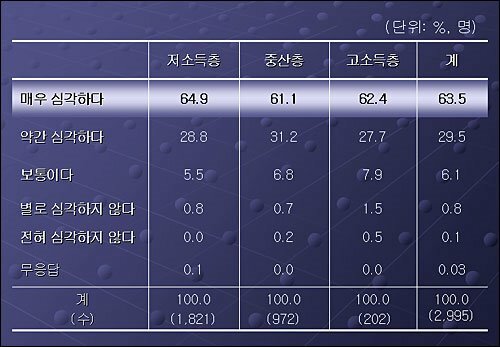 Chosun Ilbo itself and Korean Gallup had surveyed that the figure for OOP would be lower and GNP higher: 16% and 45% respectively. The article quotes a researcher from the opinion institute saying that the self-employed as well as housewives are the most receptive social groups for economic currents; one could ask that has the economy (or even the perception of the state of economy) changed so much as to warrant such a drastic change in political support? I'd say it hasn't. An interesting but not surprising piece of info is that among the "non-employed" (mujikcha) the support of OOP is 22% and GNP 41%. It's the same Opinion Institute that Hankyoreh21 has been using for its recent articles on the Democratic Labor Party: the support of the party for workers, farmers and "ordinary people" (seomin/sômin) is highest among the well-educated, well-earning white collar population. Too bad the figures showing DLP support among the different strata are too small to be readable in the adjoining article, in which the DLP support is discussed in more detail. Added a new set of pictures to my photography page: Korean local elections in June 2002, during which I happened to be present. 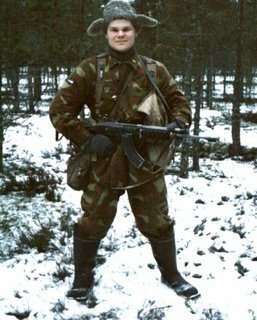 The not so good quality of the pics is because of the vulgar scan technique I use in lack of a scanner to make paper photos into files: digital camera. Click the small pic of a campaign van to the left to enter the gallery. 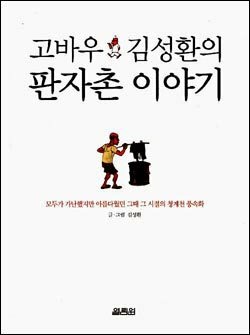 Finally gathered the necessary courage and started reading Taebaek Sanmaek by Jo Jung-rae; no, I haven't been afraid of becoming a ppalgaengi for reading it, but I've had the idea that there's too much Jeolla dialect in the dialog to enjoy the reading. There is a lot of Jeolla dialect, but that is not the main obstacle; I can grasp the dialog written as spoken language well enough. 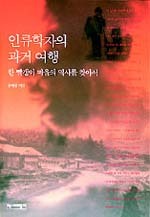 What makes Taebaek Sanmaek more laborious reading than for example Jo's later Han'gang (Han River) is that Taebaek Sanmaek is literally much more complex, the narrative techniques are more various and temporarily not linear, and even the vocabulary appears more complex and unfamiliar than in Han'gang. Perhaps it's partly a matter of period and setting: late 1940s and the time of Korean War in rural southern Jeolla versus 1960s and 70s in Seoul. 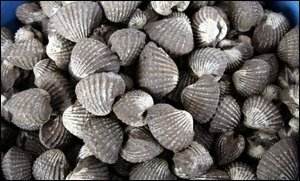 Kkomak is a tasty clam which appears especially in the muddy shores of Beolgyo (벌교) on the coast of Southern Jeolla, where much of the events of the book take place. One of the main characters Sohwa, a young shaman who gets romantically involved with Chông Ha-sôp, one of the communist rebels, is described to be able to make especially tasty dishes of kkomak, which taste kan'ganhada, cholgitcholgithada, alk'ûnhada and paerithada. Now would I check every word from the dictionary when reading the novel? No, I'd just be content knowing that the young shaman makes tasty dishes out of the clam.